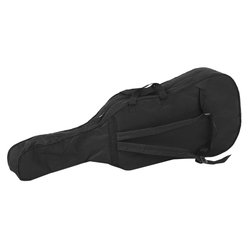 Home › Stringed Instruments › Cello › ammoon Portable 4/4 ..
Suits for 4/4 & 3/4 cello. Durable black cloth gives it good quality to against scratch and tear. Soft interior lining, with padding inside offer better protection for your valuable instrument. Adjustable handles and should strap fit most people. Exterior pockets with fastener tape to hold all your essential accessories.